Posted September 28, 2018 . Gilead Sciences, a pharmaceutical company with an interest in AIDS, hepatitis C and infectious diseases, have expanded their access initiative for AmBisome (a liposomal preparation of amphotericin B) to include cryptococcal meningitis, where previously it was only for leishmaniasis. Governments and public sector procurers in 116 low- and middle-income countries can now buy the drug at US$16.25 per 50 mg vial. Costs in other countries typically vary from US$80 to US$400. Gilead is also undertaking a number of activities to expand access to AmBisome for cryptococcal meningitis in high-burden countries, including expediting registration for this indication. Gregg Alton, Chief Patient Officer, Gilead Sciences. Amphotericin B (with flucytosine) is currently the initial treatment of choice for cryptococcal meningitis as it clears the brain of fungal cells faster than any other medication. Initially used in 1959, the standard dose in AIDS is 1 mg/kg, so about 50 mg daily. With a non-liposomal formulation, this costs around $10. Because liposomal amphotericin B has a very different overall body tissue distribution, a dose of 4-6 mg/kg daily is recommended for cryptococcal meningitis, so about 250 mg daily. The main force behind this major price reduction has been the informal advocacy group CryptoMAG, led by Dr Angela Loyse of St George’s Hospital in London who is both a cryptococcal meningitis researcher and advocate for better care for patients with cryptococcal disease. CryptoMAG first met in Geneva in 2013, supported by GAFFI, and this meeting resulted in the addition of both amphotericin B and flucytosine to the WHO Essential Medicines List. Gilead Sciences is a biopharmaceutical company that discovers, develops and commercializes innovative therapeutics in areas of unmet medical need. Their mission is to advance the care of patients suffering from life-threatening diseases worldwide. Gilead has operations in more than 35 countries worldwide, with headquarters in Foster City, California. 1. Identifying and publicizing gaps in diagnostics and treatments for fungal diseases. 2. Consulting on how healthcare could be improved through facilitating training, encouraging companies to expand their markets and recommending improvements in infrastructure. 4. Developing, implementing and evaluating countrywide diagnostic programs – Guatemala (fungal infections in AIDS) the first. 5. Influencing national and international agencies to ‘adopt’ fungal diseases alongside existing programs including TB, microbiology, AMR, NTDs and incorporation of key generic antifungals onto the WHO Essential Medicines List. 6. 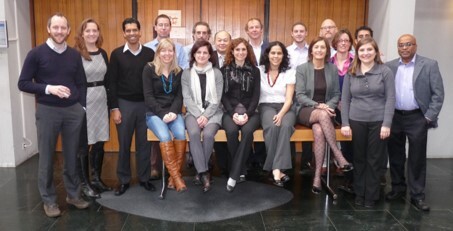 Focusing diagnostic improvements for GAFFI’s priority diseases. GAFFI issued a 10-year Roadmap in 2015 calling for ‘95-95 by 2025’: 95 per cent of patients with serious fungal infections are diagnosed and treated by 2025.